LOCATION.--Lat 41`59'15", long 77`18'09", Tioga County, Hydrologic Unit 02050104, at single-span steel-truss bridge on State Highway 49 at Elkland. PERIOD OF RECORD.--Water years 1980 to current year. 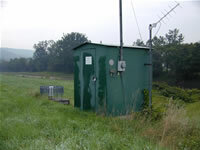 Supplied by USGS: Data transmitter operational limit - 38.0 ft; Top of levee at 35 ft.